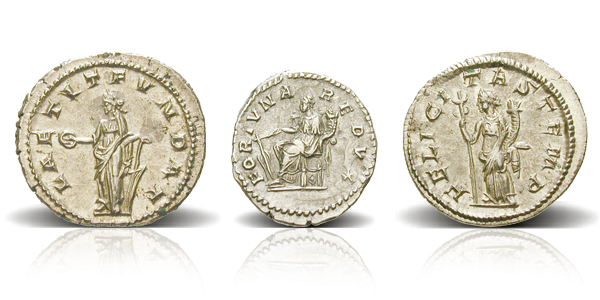 Struck in silver, these original hand-struck roman coins feature three fascinating goddesses of good luck. Fortuna, the Roman goddess of fate and fortune represents life’s unpredictability, and is often depicted standing upon a ball to show the uncertainty of fortune. Felicitas, the personification of good fortune and happiness, was frequently portrayed on Roman coins as a symbol of wealth and prosperity. Laetitia, the Roman goddess of joy and gaiety is often shown wearing a wreath for celebration, with an anchor to denote stability. Together in one set, this band of goddesses will bestow their powers of fortune onto the lucky owner, but you must act fast – there is an extremely limited number of these sets left, so secure yours while you still have the chance!